'Thayir Sadam' often known as Curd Rice/Yogurt Rice is one of the most popular South Indian dish made with sour curd/yogurt and boiled rice(normally mashed boiled rice is used). 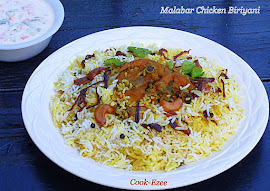 This is such a simple, ezee and tasty dish which I'm sure everyone of you make at home. I still wanted to post my version of the same, since I've couple of my friends asking me -'how do you make it?' even if each one of them make it at home but still want to know my way of making it. I love having it with a splash of hot lemon pickle. One of my best Tamilian friend says, in Tamilnadu home cuisine it is standard to eat Thayir Sadam/Curd rice at the end of lunch and dinner, which helps ease the effects of the spicy main dishes. It is also said to aid digestion. They do Curd Rice as one of their chief offerings to the God which is later distributed as 'prasadam' (blessed food) to devotees. Curd rice/Thayir Sadam can be prepared most easily by simply mixing boiled rice, yogurt and salt. But tempered/seasoned with mustard seeds, curry leaves, dry chillies, chana dal and urad dal roasted in a spoon of hot oil imparts better taste and flavor to the dish. Thayir Sadam or Curd Rice is often eaten accompanied by South Indian Mango or Lime pickles. Normally cooked mashed rice is used to make this dish, but I do not use mashed or paste like cooked rice but I do a bit over cooked rice. 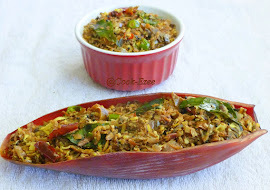 Mostly Thayir Sadam/Yogurt Rice is served cold but me and my family prefer to have them slight warm, you can serve them according to your preference. Also I use homemade slight sour curd/yogurt. Make yogurt rice today for your lunch/dinner and enjoy your simple and delicious meal !!! Take Curd/Yogurt in a wide bowl, beat it gently with a spoon/fork just to remove any lumps foemed. You can add water little by little and beat if the yogurt is very thick. Wah and drain the rice. Boil/cook rice a bit more than normal plain rice(overtook to soft but not to mash/paste form) and drain off water. Let it cool down to room temperature. Heat up a wide non-stick pan or kadai, pour oil, add mustard seeds and let it splutter. Reduce the heat to medium, add chana dal, urad dal, asefoeitida and saute for few seconds. Add curry leaves, red chilies, shallots, ginger, green chilies, salt, a tbsp of coriander leaves, cashews, raisins and saute for a minute or two till shallots turn light brown. Add rice little by little, while stirring them to mix well with the Yogurt. Check for the salt and adjust. Mix gently till the rice become luke warm and take off the stove. Garnish with the rest of the chopped coriander leaves and serve warm or cold. Very comfort and delicious food. sooper cooler meal,perfect for a hot summer day..Delicious tempting one!! this is a huge tasty time saver & a important part of our lunch during summer....love it ! Delicious and can have it anytime..
Wat a comforting food, love to have it.